Stewart McMillan has been in the fire industry since childhood. His earliest recollection is riding back to the fire station on the knee of a Chicago Lieutenant on Squad 2 when he was six years old. All through his childhood years, Stewart found hanging out at the fire station to be far more interesting than hanging out with other kids. 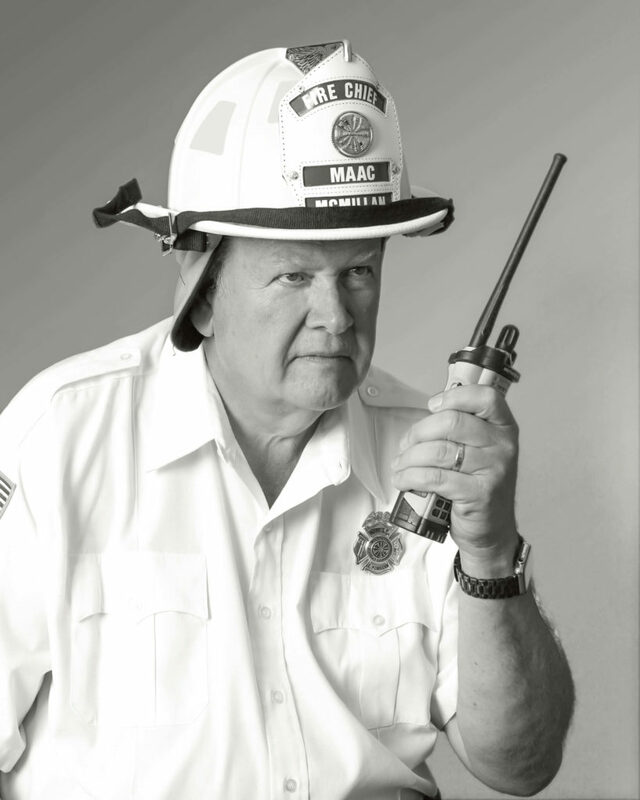 As Chief Clyde McMillan, Stewart's father, grew the Gary Fire Task Force, Stewart was there weekend after weekend helping rebuild and maintain the menagerie of old fire apparatus that the Civil Defense Fire Department had managed to obtain. In 1968, at the age of 14, Stewart drove a 1947 International Pumper to a lumber yard fire, and connected it to the hydrant with a hard suction all by himself. From that point on, he was involved with the Gary Fire Task Force up through 1973. Stewart attended Purdue University Calumet where he received the first interdisciplinary degree in engineering, while working full-time to help his father in the struggling family business. In the early years of the company, he was involved with the manufacturing of the company, while his father and brother, Doug, handled the sales aspects. Task Force Tips continued to grow rapidly, and in May of 1976, groundbreaking took place for their first facility in Valparaiso, Indiana. In the fall of 1982, a great tragedy struck the McMillan family when Chief Clyde McMillan died suddenly. It was at this time that Stewart, age 28, became President of Task Force Tips, Inc.
Stewart takes an active role in all aspects of the company's operations. He is a visionary leader that continues to look for new technology and better ways of manufacturing equipment. Under his leadership the company continues to expand and meet market demands. As a result of the innovative computer systems he has employed and has highly committed employees. Task Force Tips sets the industry standards for on-time deliveries, product quality, and follow-up service. Stewart is a member of the Valparaiso Rotary and The Greater Valparaiso Chamber of Commerce. He is also active in the World Presidents Organization, active member of the Ivy Tech Board of Trustees, MAAC Foundation and National Association of Manufacturers. Stewart has also been a member of the Union Township Fire Department and Washington Township Fire Department, and has held officer positions on both departments at the same time. An aviation enthusiast, he is also a certified instrument multi-engine pilot, a member of Experimental Aircraft Association, and the Airplane Owners & Pilots Association. In addition, on various occasions, Stewart has flown several "missions" for LifeLine pilots--a non-profit organization that flies patients with healthcare needs to the proper facilities, entirely through the donation of the pilot's time and aircraft. Stewart and wife, Kathryn, have two children, Kelly and Ian. Most recently became grandparents to their grandson Mack.